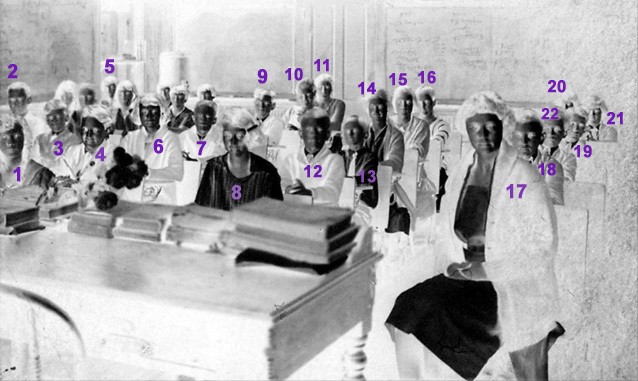 Comments: Miss Moore taught the 9th grade on Scottsville's 'School Hill.' The public school moved to this large, double-gabled grey building above Valley Street in 1906 from its previous location at the Brady Building on Valley and Main Streets. 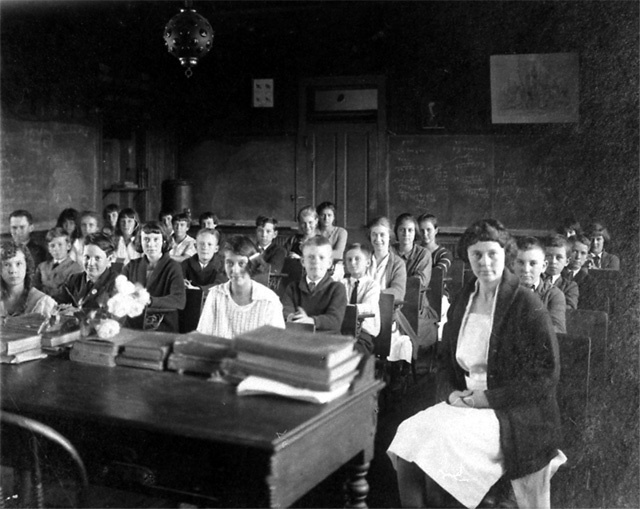 Measuring 68'x40', the school contained four large rooms with a generous hall and cloakrooms on the first floor, and an assembly room, above, with a superb view of Scottsville and the James River. Topped by a bell tower, the school's robust bell could be heard for miles. 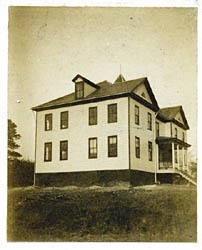 In 1926, the new Scottsville High School was completed on West Main, and this school on 'School Hill' was razed. (1) Dorothy Goodman; (2) David Steger; (3) John Meredith; (4) Willie Moore; (5) Alice Dawson; (6) Madeline Smith; (7) Roy Hamner; (8) Dorothy Kaiser; (9) Merrill Carter; (10) Miss Wright; (11) Miss Dameron; (12) Daniel Ragland; (13) Raymon Thacker; (14) Josephine Powell; (15) Dorothy Phillips; (16) Gracie Moore; (17) Miss Moore(teacher); (18) Iredell Hayman; (19) Walter Geyer; (20) Virginia Steger; (21) Miss Baber; (22) Wade Powell.